Did Nikola Tesla really run a touring sedan on free energy? 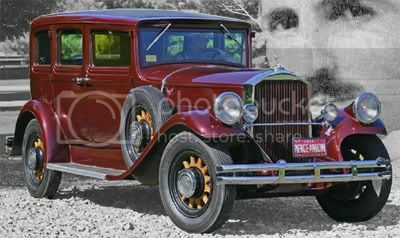 PHOTO CAPTION: 1931 Pierce-Arrow touring car similar to the one alleged to have been converted by Nikola Tesla and his nephew to run on some unknown form of energy. Tesla is said to have sold his alternating current patents to Westinghouse for $15 million, but by his death in 1943, he was penniless. In the summer of 1931, Nikola Tesla, the inventor of alternating current and the holder of some 1200 other U.S. patents, along with his nephew Peter Savo, installed a box on the front seat of a brand new Pierce-Arrow touring car at the company factory in Buffalo, New York. The box is said to have been 24 inches long, 12 inches wide and 6 inches high. Out of it protruded a 1.8 meter long antenna and two ¼ inch metal rods. Inside the box was reputed to be some dozen vacuum tubes -- 70-L-7 type -- and other electrical parts. Two wire leads ran from the box to a newly-installed 40 inch long, 30 inch diameter AC motor that replaced the gasoline engine. As the story goes, Tesla inserted the two metal rods and announced confidently, "We now have power" and then proceeded to drive the car for a week, "often at speeds of up to 90 mph." One account says the motor developed 1,800 rpm and got fairly hot when operating, requiring a cooling fan. The "converter" box is said to have generated enough electrical energy to also power the lights in a home. The car is said to have ended up on a farm 20 miles outside of Buffalo, "not far from Niagra Falls." So what was the power source? Some charged "black magic", while others remained naturally skeptical. Tesla is reputed to have removed the box and returned to his New York City laboratory without revealing how he did it, though the suspicion lingers to this day, on the 150th anniversary of his birth in Smiljan, Croatia on July 9/10, 1856, that he had somehow tapped into the earth's magnetic field or perhaps even more exotically, zero point energy or gravitation waves. We will, of course, probably never know how he powered the car, or even if the event actually took place -- though we know Tesla was an unparalleled genius when it came to understanding electromagnetism and how to apply it for benign and some allege, deadly purposes. Legend has it that he actually invented a death ray of some type and this is why the government, on his death in 1943, is said to have confiscated all his personal papers. Presumably, they didn't want his research falling into the wrong hands… or was it because they didn't want the world to figure out how to propel our vehicles on free energy? Is the story of the free energy 1931 Pierce-Arrow just another "urban legend"? I have no way of knowing, but it seems a fitting memorial to a mysterious man who transformed the world as we know it, providing millions with electricity and billions in profits for some of world's largest and most powerful multinational corporations. That car seems like an urban legend. Nobody's successfully demonstrated a "vacuum-energy" energy source; one such claimant was reportedly continuing to draw electricity from the grid. And there'd be severe physical difficulty with it happening. So I'll believe it when I see it. Finally, I'm reluctant to derail this thread by discussing jess's link, though I think that it's VERY interesting. That was related, I swear! The band is named after one (or more) of the guys in the band who is / are related to Nikola Tesla! Related to jess's link, the locals had believed that the Tunguska disaster was a visitation of their fire god Ogdy, who had cursed the area by smashing trees and killing animals. They thus refused to visit the area for several years. I didn't want to derail this thread by discussing that, however. How can that derail this thread? All talk Tesla is welcome! I can't recall the name of that movie. It was bizarre! Speaking of Tesla cars, have y'all seen this one? I decided to read up on Nikola Tesla, and he's a rather mixed bag -- a great inventor and a very eccentric personality. In the late 19th cy., he got involved in the "War of the Currents" over the best way to distribute electricity. Thomas Edison, that great inventor, preferred direct current, electricity flowing in only one direction, and his approach got widely used at first. But Nikola Tesla and George Westinghouse had been working on rotating magnetic fields and had developed alternating-current motors and generators. As the name says, alternating current continually reverses direction. It turned out to be much easier to change the voltage of alternating current than direct current -- you don't need a motor-generator, just a transformer, which is one electromagnet making an electric current in another electromagnet. And for transmitting electricity, you want to keep the current down to lower electrical-resistance losses, and the way to do that is to bump up the voltage. And alternating current made it relatively easy to do so. Eventually, alternating current won out, and Thomas Edison regretted not taking it very seriously. But he later came up with an idea that was less practical -- wireless electrical transmission through the Earth's surface. He demonstrated it by lighting some lamps about 25 mi away from his generator, but his attempt at a full-sized transmitter was less-than-successful; it was never completed. His financier, J. Pierpont Morgan, famously asked about it, "If anyone can draw on the power, where do we put the meter?" And later work showed that Tesla's proposed system was not very feasible for large-scale electricity distribution (WIkipedia reference). There's also the serious question of Tesla's demonstration -- how much of his generator's electrical energy got caught by those lightbulbs? The War of the Currents used Buffalo as the battlefield. During the Pan American Expo, Edison and Tesla both worked here to get power from NF to Buffalo fro the Fair.